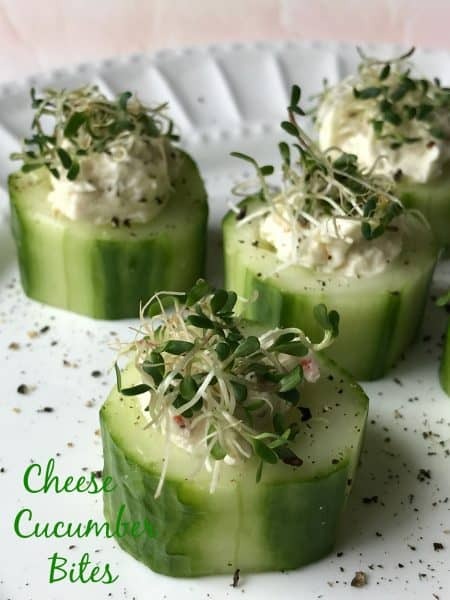 The secret to making cucumber bites a success is twofold. Make sure to slice the cucumbers thick enough. After all, you have to be able to stuff them. 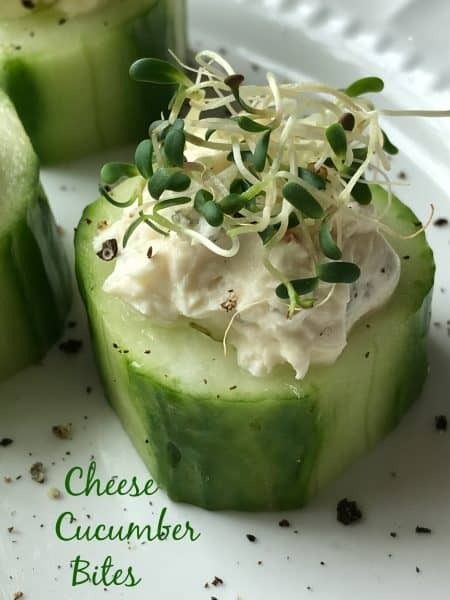 Secondly, you don’t want to scoop out all of the cucumber from the center of the slices. Why? The stuffing might/will/can fall out of the bottom. God knows, you don’t want your filling falling out of the bottom! 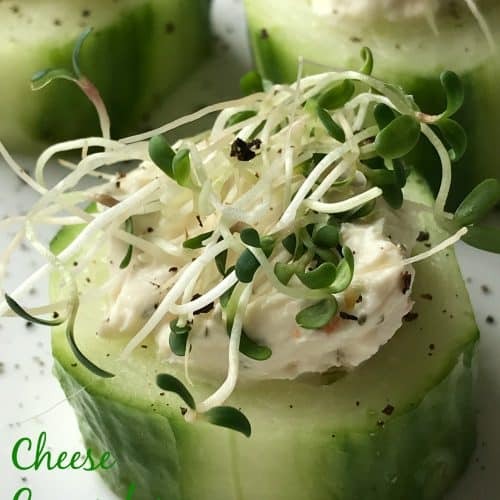 Cucumber ‘Bites’ means just that, keep them ‘bite size’ with a two ‘bite’ minimum. For this recipe we used a fantastic vegetable cream cheese spread from Laack Bros. Cheese. 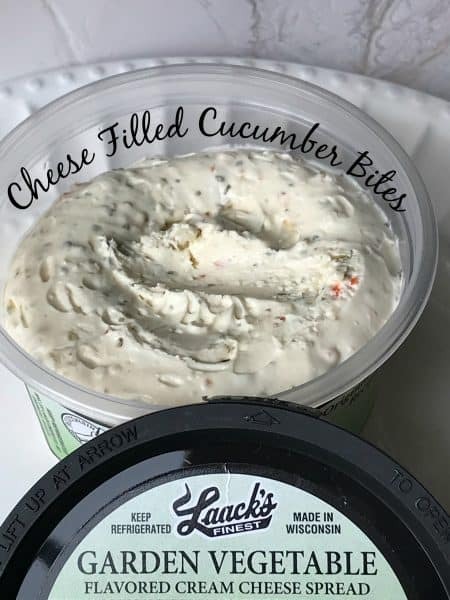 Laack Cheese is a Wisconsin based cheese company. Laack Bros. Cheese Co., Inc. began in 1986 as a cheese and butter wholesaler. Through the years, they have added cold pack cheese and cream cheese spreads. Laack Bros. is family run and located in Greenleaf WI. Substitute any brand of vegetable cream cheese spread or low-fat spread if Laack cream cheese isn’t available. “Jack and the Green Sprouts” is also a Wisconsin based company. 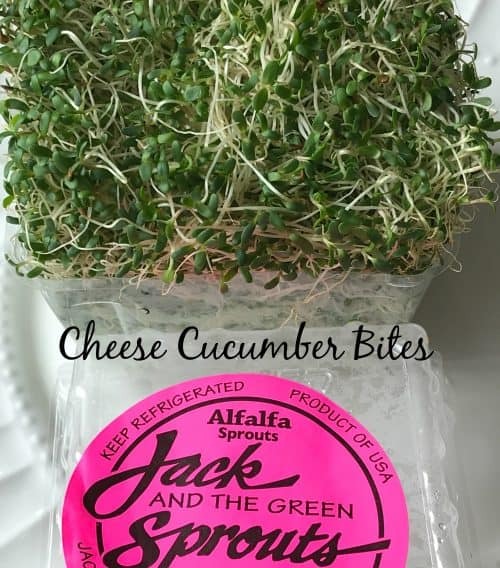 Joe and Jack Mahoney started growing alfalfa sprouts in their mother’s basement in 1976. After a few years of growing sprouts for family and friends, Jack Mahoney moved to River Falls, Wisconsin. In the 1980’s, Jack started Jack and the Green Sprouts. In 1989 Joe Mahoney became an official partner of Jack and the Green Sprouts and in 1991 he bought the company from his brother Jack. Soon after, Joe built the indoor hydroponic buildings that are in operation today! A few years later, his sons Vincent and Blake came to work for Jack and the Green Sprouts full time. They wanted to learn the business their father built. Fast forward a few years, Vincent and Blake are now currently running the business. They’re in the process of becoming the new partner owners of Jack and the Green Sprouts thus carrying on their sprout growing legacy! Today Jack and the Green Sprouts is truly a family operated and owned business. Keeping to the down home mom and pop values that make this small business the best supplier of sprouts in the Mid-West! 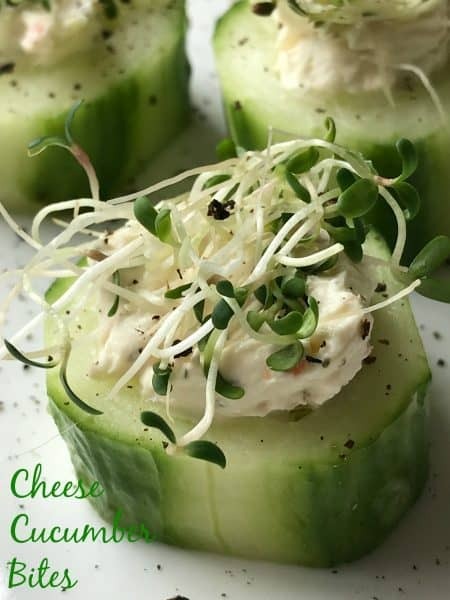 Here is another ‘Lite Bite’ recipe you’ll want to try. Open faced Cucumber Sandwich. With spring slowly creeping around the bend here in Northern Wisconsin, you might be planning trips to take this summer. Don’t forget to plan a few stops at one of the many wineries that are dotted throughout Wisconsin. Three Lakes Winery is one such winery. It’s a fantastic winery and their wine/cheese spreads are simply to die for! With names like Blueberry Bleu, Cranberry Cheddar, Blackberry Swiss and Elderberry Horseradish you have the best of the best to pick from. Made with Three Lakes Wine and Wisconsin Cheese, they’re super delicious. I’ve purchased every flavor and we love them all. Hmm, I wonder. 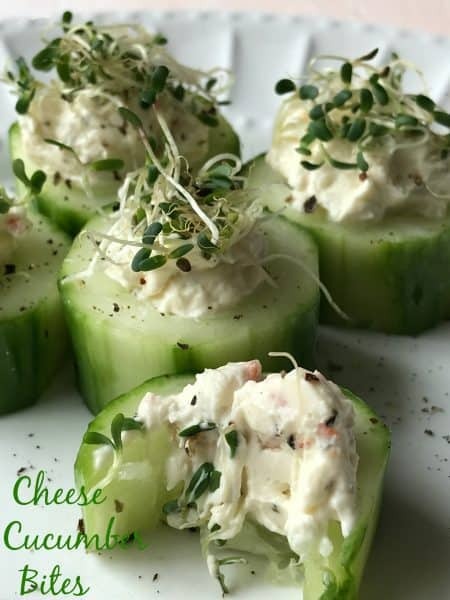 Stuffed Cucumber Bites with Three Lakes Cheese Spread? Sounds like a good plan to me. The cheese spreads sell for $6.50 a piece, so stock up! A delicious and refreshing appetizer. Perfect for the upcoming summer months, when a cool and refreshing appetizer is much appreciated. Peel strips from cucumbers to create striped edges; Pat dry with paper towels. Slice cucumber into 1 1/2-inch to 2-inch slices. Using a small sharp knife cut a small circle in the top of each cucumber slice. With a small spoon, scoop out some of the cucumber. Don’t go all the way through the cucumber. 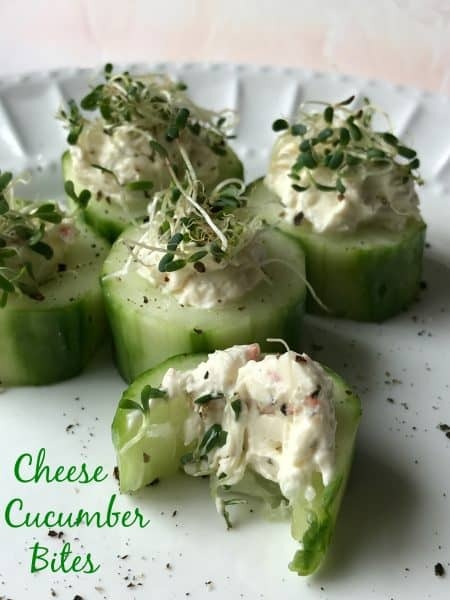 Spoon a small amount of cream cheese into the cucumber opening. Top with a small amount of alfalfa sprout. Sprinkle with fresh cracked pepper.